● 2 switchable analog audio inputs. 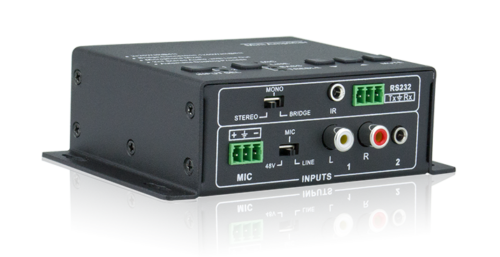 ● One 3-level MIC input with mixer function. ● Stereo, Dual mono & Bridge output mode selectable. ● Bass, Treble & Volume adjustable. ● Loop output to cascade to another PA2B. ● Controllable via button, RS232(optional IR via IR-PA2B).